Very excited to be working with the Queen of Hoxton this summer, bringing a special Wild Life Drawing class to their beautiful rooftop space. 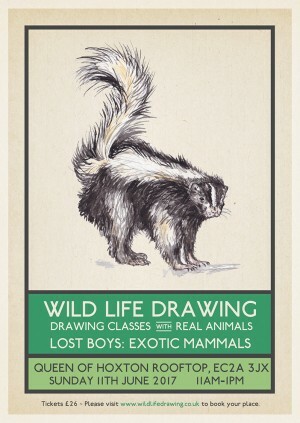 Inspired by their theme of Never Never Land, we'll be meeting and drawing a wonderful selection of small mammals that were embodied by Peter Pan's Lost Boys – including skunks, squirrels, rabbits and a fox! The drawing class will be taking place on a peaceful summer Sunday morning, before the rest of the venue opens to ensure a quiet and calm environment. We'll have free rein of the rooftop, and as well as sketching the animals in their bespoke runs, we will also learn about their habitats in the wild, their varied diets and adaptions to urban life as well as the complex care they require and any conservation issues affecting these species. Wild Life Drawing is working with the finest animal handlers, sanctuaries and organisations to put on these events. The animals attending the session are all fully accustomed to travelling, to different environments and are happy interacting with humans. They will be attending with two experienced animal handlers that care for these animals as well as rehoming other unwanted pets or rescue animals. Every precaution and preparation has been made to ensure a calm and comfortable journey and environment for these animals; the welfare of the animals is our utmost priority.